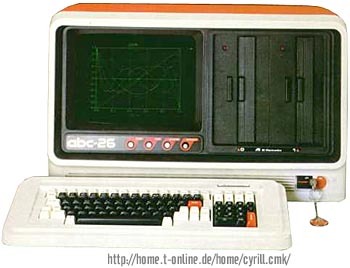 The ABC-24 and ABC-26 could run up to 8 programs simultaneously and couls manage 7 workstations under M/PM (according to the advertisement). they had a real-time clock and 96 graphic symbols built-in. Picture courtesy of Computer Modell Katalog. see more AI Electronics ABC 26 Ebay auctions !